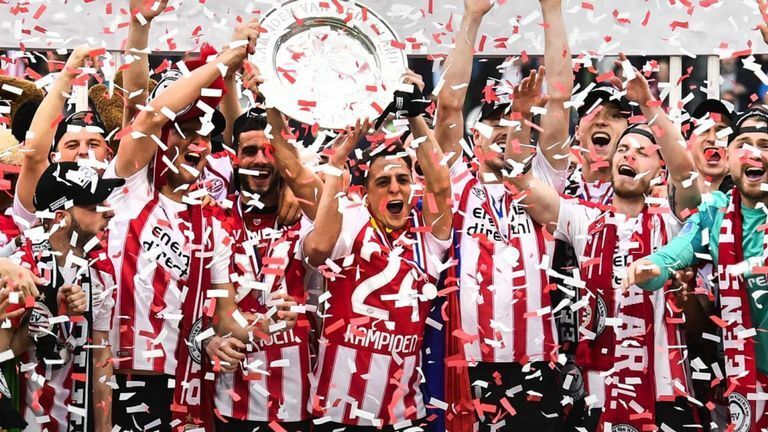 PSV Eindhoven sealed the Dutch Eredivisie title with a comfortable victory over nearest rivals Ajax – who ended up with nine men. Gaston Pereiro put PSV ahead after Hirving Lozano’s shot had been blocked on the line by Matthijs de Ligt. Luuk de Jong headed home Joshua Brenet’s cross and Steven Bergwijn’s half-volley sealed the victory. Nicolas Tagliafico was shown a second yellow and Siem de Jong, Luuk’s brother, was sent off for a bad foul. Phillip Cocu’s PSV, who have three games left to play, have won three of the past four league titles. Feyenoord, the deposed champions, are down in fourth position.